We were contacted by a family in Wombwell, Barnsley, South Yorkshire to come and look at their Edwardian hallway floor that needed a lot of work to restore it. 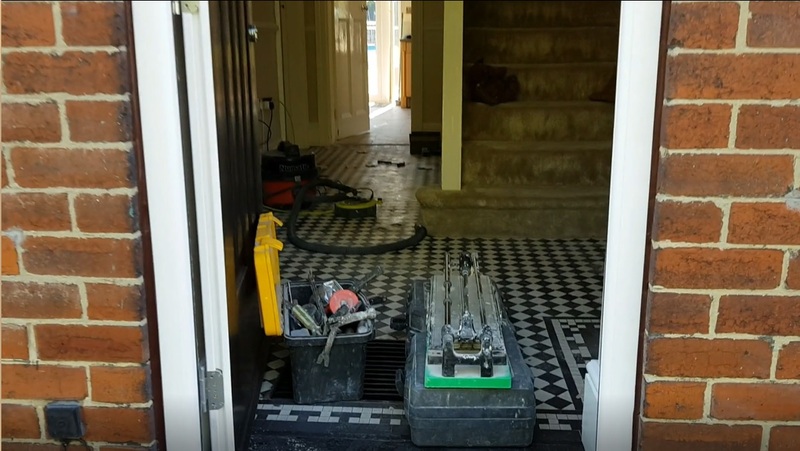 The traditional black and white design had a lot of loose, chipped and broken tiles that needed replacing and repairing. Another company had cleaned the floor previously but there was hardly any sealer still present making the floor an easy target for stains and ingrained dirt. 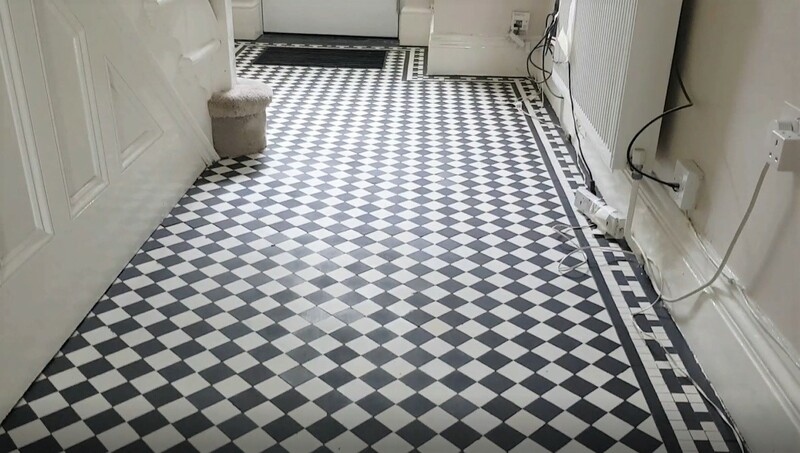 I drew up a three-day plan to repair, clean and seal the hallway floor, but before work could start I spent time sourcing replacement tiles to perfectly matching the originals. It can be hard to track them down, but we usually can. Once that was done we were all ready to go. 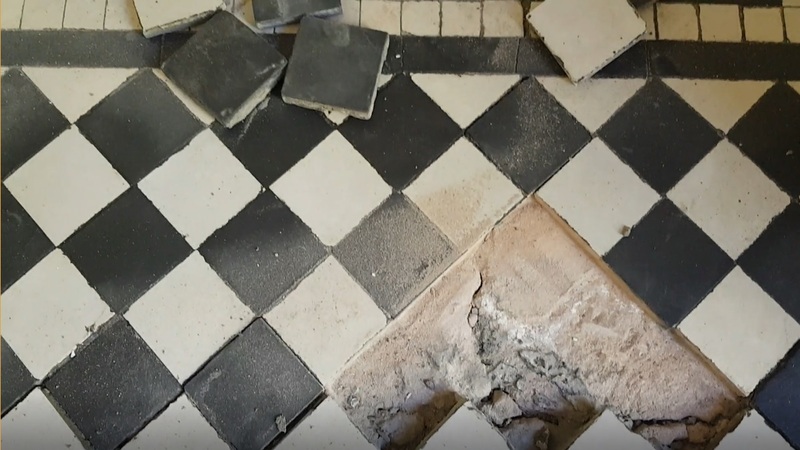 The first day was spent repairing the floor, we used a combination of angle grinders, multi tools and chisels to remove all the chipped and broken tiles. The loose tiles were fixed back in place and the replacement replica tiles were fixed in place of the broken tiles. 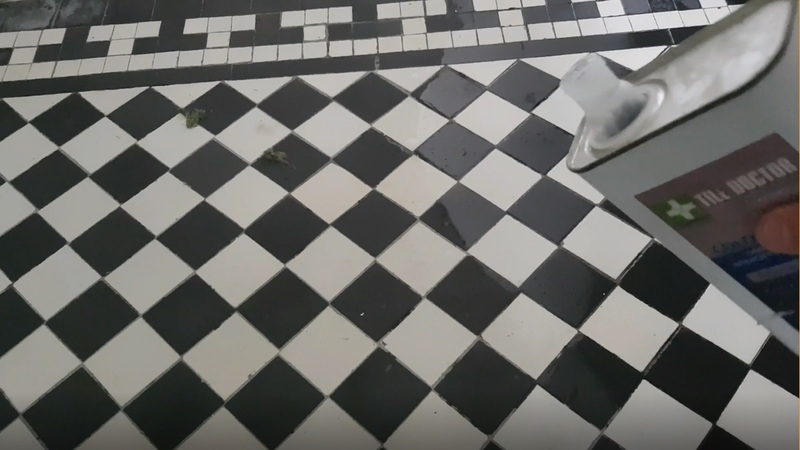 A few of the less damaged tiles were left in place to ensure the floor looked true to the era. The floor was left to set overnight. On the second day I got to work using Tile Doctor Remove & Go. This was applied to the floor and left to dwell for 15 minutes, this breaks down the old sealer and ingrained dirt. We then attached a 200-grit diamond pad to a weighted rotary slow speed floor polisher and went over each area several times. The slurry was extracted using a large wet vacuum. 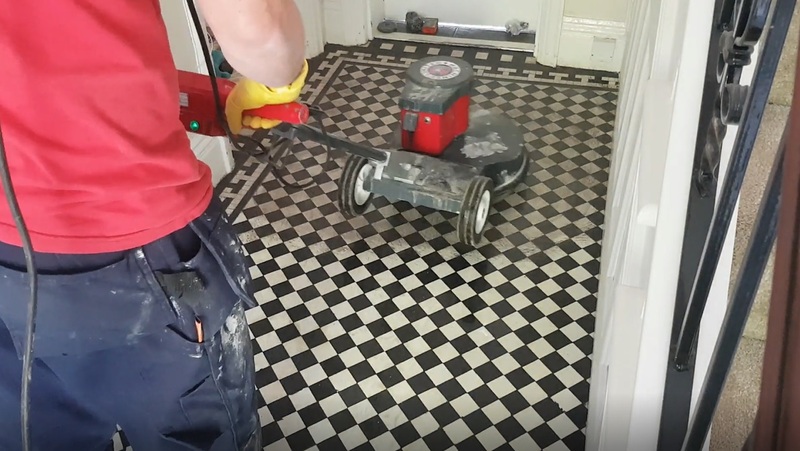 With damp being a big issue in these big old houses we always need to take efflorescence (salt staining) into consideration, when these types of floors were fitted 100 years ago, Damp Proof Membranes didn’t exist so any moisture below the floor will eventually rise to the surface through the tiles. This can leave white salt deposits on the surface. Knowing this can be an issue I gave the floor an acid wash to neutralise the alkaline salts. 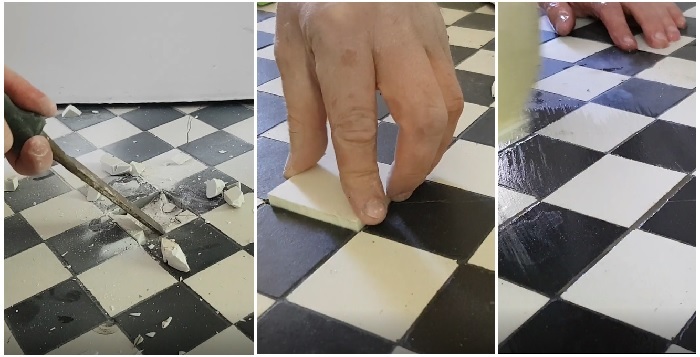 This was done by applying Tile Doctor Acid Gel to the floor and leaving it for 10 minutes before the rotary machine fitted with a 200-grit diamond pad was used to work the product into the tile. Once this was done the slurry was extracted again using the wet vacuum and the floor rinsed. Then using damp cloths, we removed all the residue. After being left over night to fully dry we returned the next day to seal the floor. We first tested the moisture levels to ensure it was fully dry. All was well so the first of four coats of Tile Doctor Colour Grow was applied to the floor. Colour Grow is, a colour enhancing impregnating sealer that helps bring out the natural colours in the tile whilst protecting the tile from within, this sealer is also fully breathable which is important for old tiled floors as it allows the floor to breathe and allows moisture to pass through the tile and evaporate. 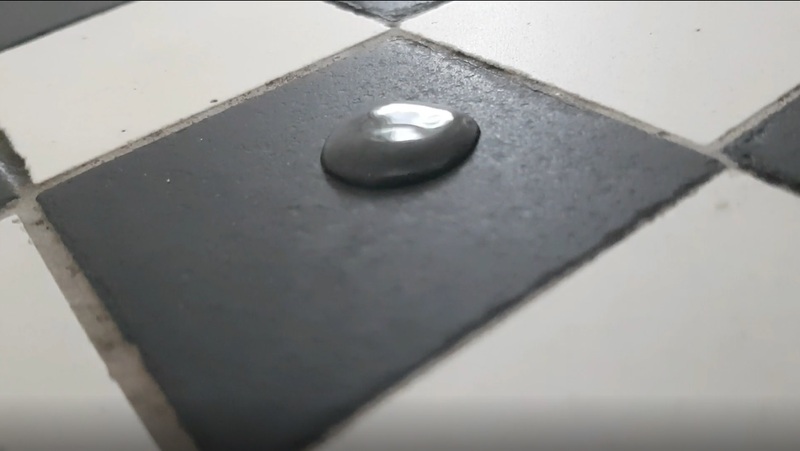 You can always tell when you have applied enough sealer by adding a droplet of water to the tile, if it forms a bubble on the surface of the tile as in the photograph below then its fully sealed. Conversely if the floor becomes sticky then you have applied too much sealer. The customer was highly delighted with the newly restored floor. The hall is now fully restored and looks clean and inviting, it will also be much easier for them to keep clean going forward.